Because Buffalo-NiagaraGardening.com is the proud sponsor of the upcoming Celebration of Coleus & Color exhibit at the Buffalo and Erie County Botanical Gardens, I was given a peek of what’s in store–It’s going to be spectacular! I got to see some of the containers being prepared for the show and Jeff Thompson, director of horticulture at the Botanical Gardens, shared tips you can use at home, too. Mark your calendar: The show will be held from 10 a.m. to 5 p.m. daily from Saturday, June 14 through Sunday, July 27 at the Botanical Gardens, 2655 South Park Ave., Buffalo. Admission is $9 for adults, $8 for seniors (age 55 and older) & students (13 and older with ID), $5 for children ages 3-12, and free for members and children under 2. Try these tips from the experts on how to create interesting container plantings for your landscape. A pot with a single colorful plant, such as fuchsia, can be lovely, but it can be interesting to mix plants, too. Choose a plant that cascades over the side of the pot, a plant that is upright or spikey and a plant at the middle level, Thompson suggested. “You can get a lot of interest in a small space, which is the object of container gardening,” he said. However, you have to choose plants that will grow well together. Read the plant tag and choose plants that have similar growing conditions. Don’t mix sun-loving plants with shade plants. Don’t mix plants that like drier soil with plants that like a lot of water. Keep an eye on your plants as they grow throughout the season, too. The various plants may not grow at the same rate. If you don’t watch out, one plant could grow much larger and overpower the others. 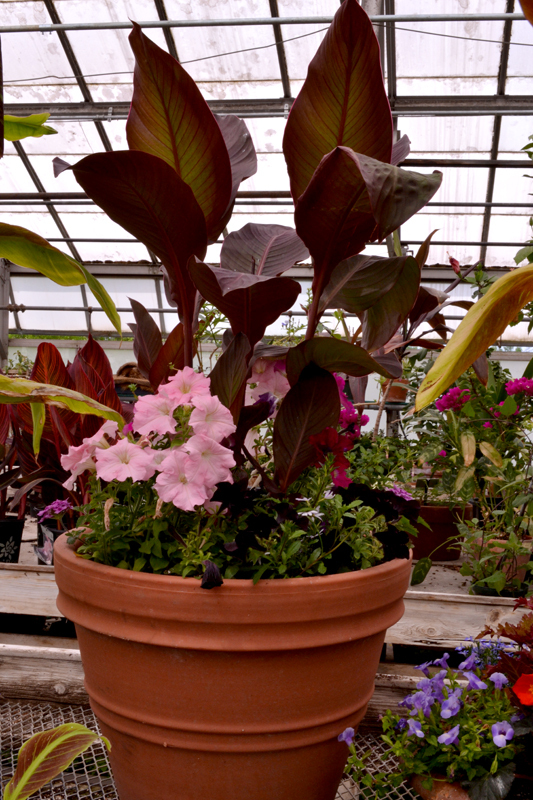 The color of your pot plays an important role in the overall look of your container. There are two ways you can go, Thompson said. You can choose a container that coordinates with the color of your flowers or choose one that contrasts. For example, if your flowers are pastel colors, you could choose a pastel pot to coordinate with them. For contrast, choose a bright pot. Use less potting soil by filling a large pot partway with packing peanuts or crumpled six-pack plant containers to take up space. 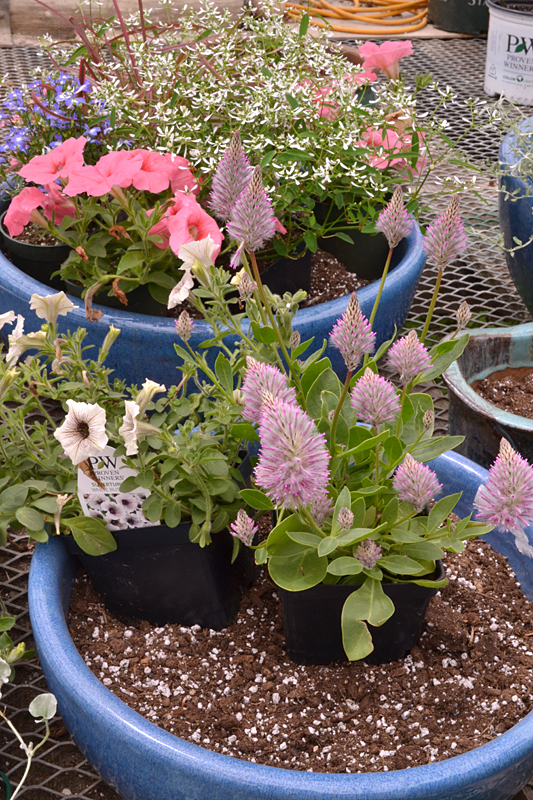 Choose plants you think you will want to use in a particular pot and set them in the container, Thompson suggested. You’ll be able to really see how the color of the plants and pot work together before everything is planted. Take a step back and look at the whole arrangement from a normal viewing distance. If you don’t like how it looks, it’s easy to make changes. I think this works well if you’re buying plants and a pot at the same time. You could do this right at the garden center. It’s also a good tip if you like to pot up a bunch of containers to use all around your yard and patio and have lots of plants and pots to work with. Thompson has aisles filled with annuals that will be used in the show. Much of the plant material was donated by Zittel’s in Hamburg. One thing you have to remember is that containers dry out more quickly than garden beds do. You need to water containers more often than you need to water garden beds. Glazed pots hold moisture better than unglazed pots, he said. 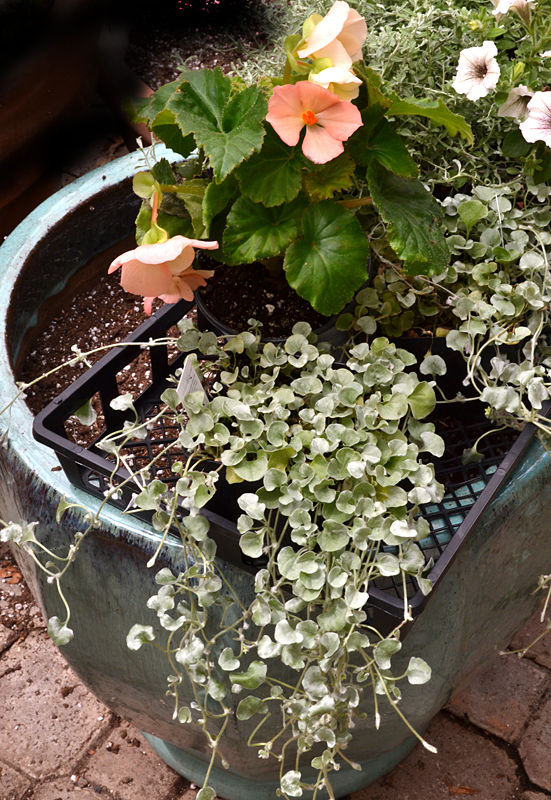 If you use plants that need to stay moist, choose glazed pots. Use unglazed pots for succulents and plants that like a drier environment, or plan on watering them more often. To help the soil retain moisture, mix in those gel-like particles that you can buy under various brand names. Thompson says they really do help. Incorporate them into the soil before you plant. You can save money, improve drainage and keep large pots lighter and easier to move if you don’t fill the pots entirely with soil. Potting mixes can be expensive and I’m stingy with my soil, so I love this tip. Thompson said many of the plants they are using need only a foot of soil, so there’s no reason to fill the entire pot with dirt. Next time you get a package mailed to your house, save those foam packing peanuts and use them to fill most of the pot. Cover the packing peanuts with landscape fabric, then cover the landscape fabric with your potting mix. Some large trees inside the Botanical Gardens are grown in large pots that are half-filled with the packing peanuts, he said. You might not have packing peanuts, but you probably have the six-pack containers that plants come in when you buy them at a garden center. (They’re those thin, rectanglular, black plastic containers that you get six plants in.) Crumple up those containers and put them in the bottom of your pot. Both of these materials, packing peanuts and crumpled six-pack containers, will take up room and help provide proper drainage. “Nothing will kill a plant quicker than poor drainage,” Thompson said. Plus, the pot will be much lighter and you’ll be able to move it to different locations if you have to. So many gardeners are struggling to find color and interest for their shady areas. They used to use impatiens, but now that downy mildew is killing impatiens, many gardeners are looking for alternatives. 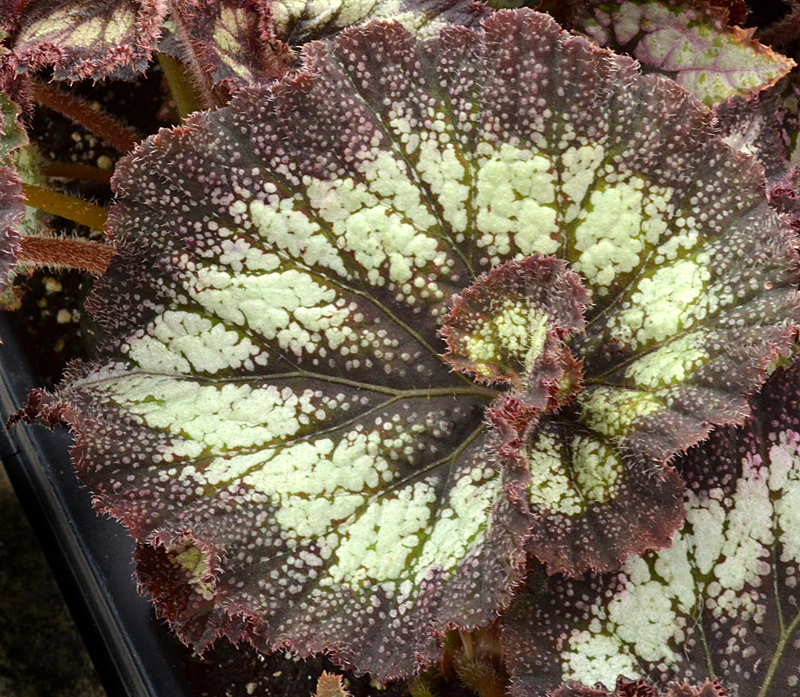 Begonias are a good choice in containers as well as in the garden, Thompson said. Many have fantastic leaves, plus you get the flowers. 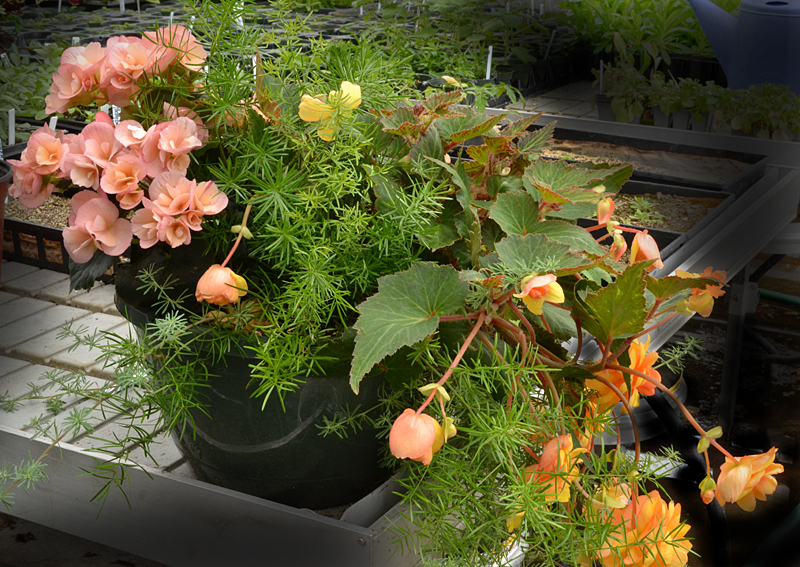 You can mix different types of begonias in one pot. Mixed pots of begonias were very popular at the Botanical Gardens’ Great Plant Sale held in May, he said. While you’ll see great displays inside the Botanical Gardens during the Celebration of Coleus & Color, make sure you set aside time to appreciate the front walkway and stroll through the outside perennial gardens, too. There will be lots of color everywhere! Garden Railway exhibit by the Western New York Garden Railway Society starting Saturday, June 7 that will include a traditional railway layout as well as Thomas the Train. Monarch Madness, where you’ll be be able to walk among the butterflies on Sunday, June 8. Starry Night in the Garden, where popular musical groups, local restaurants, wineries and breweries come together to party into the night to benefit the Botanical Gardens, on Wednesday, June 18. 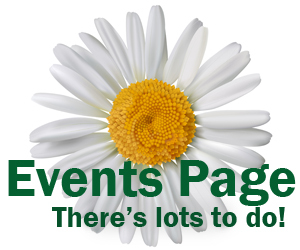 New: Hosta Show by the Western New York Hosta Society on Sunday, June 22. As for containers, I use plastic, gallon milk cartons in my large glazed pots to take up space. I’d say it makes them lighter using a good potting soil as well, but the containers are too big to move no matter how light I make them. Oh, that’s a great tip. Thanks for sharing! I use empty plastic water bottles or even empty pop cans to fill in the pots. Then I put the container on a wheeled saucer and I can move it any where any time! Donna, that’s a great tip! I like that you have the ability to move it where you need it. Thanks for sharing!